Oh My broke her maiden at Laurel Park. Photo by Jim McCue, Maryland Jockey Club. 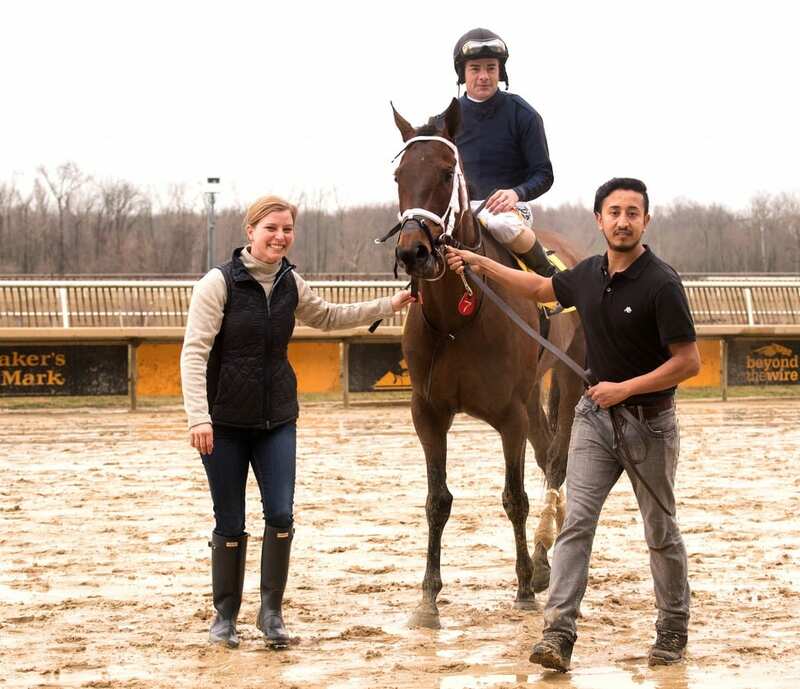 Brittany Trimble hesitated when asked if she’d expected Oh My, the four-year-old Medaglia d’Oro filly she trains for Peter E. Blum Thoroughbreds LLC, to run as well as she had following Sunday’s fourth race at Laurel Park. “She’s been training good, but I’ll tell you, I uh… no,” she finally said with a laugh. Making her first start in 13 months, Oh My grabbed the early lead and didn’t look back, outgaming favored Sister Patricia and holding off the late run of Bash to win by a half-length to break her maiden in just her second start. It was also Trimble’s first start – and first win – as a trainer. Trimble, 28, got started in the horse business at age 13 in her native Pennsylvania. “I was riding babies on the farm,” she said. She’s also worked for trainer Ron Moquett, Jimmy Jerkens, and Brad Cox. 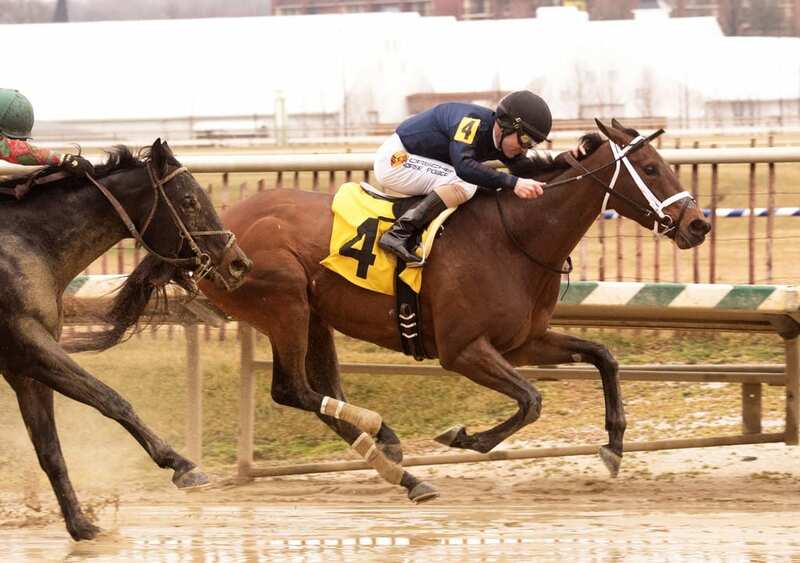 Trimble has eight horses in training at Laurel Park, and two of them ran on Sunday. Three races after Oh My’s victory, Karma, also owned by Blum, ran sixth in an allowance race. Oh My is an extraordinarily well bred filly. By top sire Medaglia d’Oro, she is out of the Mt. Livermore mare Proposal. She is a half-sister to four stakes winners, including $400,000 earner Inspired. Oh My, with Feargal Lynch up, broke her maiden and gave trainer Brittany Trimble, at left, her first win as a trainer. Photo by Jim McCue, Maryland Jockey Club. She made her debut in January 2017, finishing a well-beaten fifth behind Corporate Queen. Corporate Queen went on to run third, beaten just two lengths, in the 2017 edition of the Grade 2 Black-Eyed Susan Stakes. Oh My hadn’t run since, but Trimble said that was — more or less — by design. While she showed no speed in her debut, Oh My’s dam was a stakes-placed sprinter, and today, she showed good speed in tugging the field through an opening quarter-mile in 23.39 seconds under Feargal Lynch. Sister Patricia, the favorite, challenged her nearing the quarter-pole but could not get by. And the late run of Bash, with Sheldon Russell in the irons, came too late to change the outcome. Running time for the seven furlongs was 1:25.50 over a sloppy, sealed main track. Oh My paid $11.80 to win and topped an exacta worth $68.60. Trimble is engaged to jockey Sheldon Russell, who ran second in this race, his mount’s menacing late run falling less than a length short. Trimble laughed when asked if she was thinking angry thoughts at her fiance as he loomed up in mid-stretch. Thank-you. Was wondering who Ms. Trimble was; and “The Biz” as usual, answers my query. 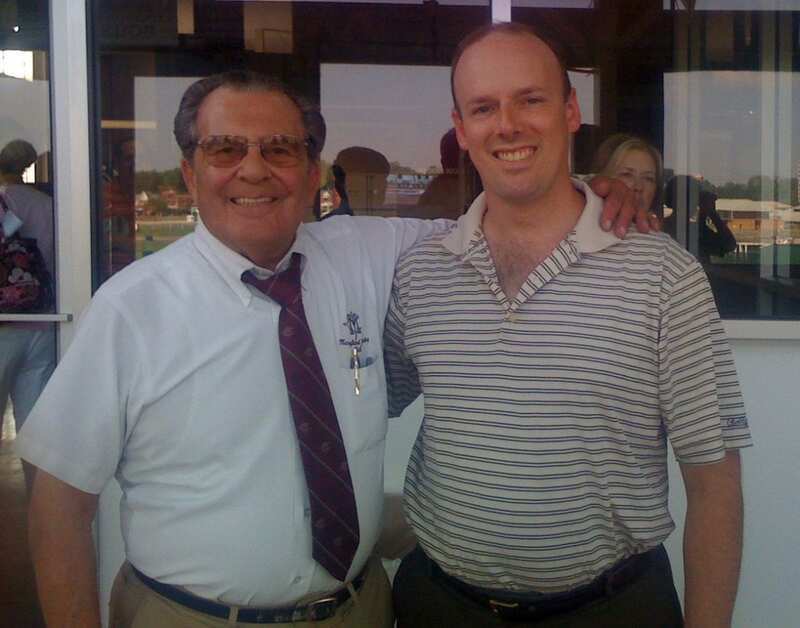 Appreciate the info on Trombetta msw winner on Saturday too. Speaking of maidens, I see 3 yr olds competing against 4 yr old maidens now. All things being equal, (a loaded question) how much of an advantage would you give the 4 year olds this time of the year? Thanks, Bill – appreciate the kind words. I hear you, nobody wants to lose money by betting on a 4 or 5 yr old maiden claimer! But look at the 9th race at Laurel this Friday. A maiden 12k-16k 1 mile race. If we can beat the favorite, Malibu at Midnight, I think we will take down the 30k pk.6! Look at the 3 yr old Zeke the Streak and 4yr old Macue. They both ran 2/10/18,same md clm. condition, and basically ran the same race. Except the 4yr old had to run a 60 beyer to win his race and the 3 yr old had to run a 50 beyer to win his race. Only difference is that Zekes race was restricted to 3 year olds. Maybe the weight allowances even things out, but all things being equal, I’m taking the 4 yr old this time of the year.